PURPLE RIBBON CLIPPEN (#157) with the above imprint. Wite barrel pen with purple ribbon clip & imprint. *Minimum Order of 25 Clip pens is required. Stock imprint above(no setup charge). *We can also customize this pen with your organization’s logo or message. For custom imprint orders there is a one time plate/setup charge of $35.00 and a minimum order of 250 pens @ $0.89 each. All design services are free. RIBBON CLIP PENS(*Custom imprint order...Item #147-C). *CUSTOM IMPRINT Order (minimum 250 pieces). *$35.00 Plate/Set-Up Charge on custom orders only. Buttons, Lapel Pins, Magnets, Pencils, Pens, Stickers, Wristbands & more. 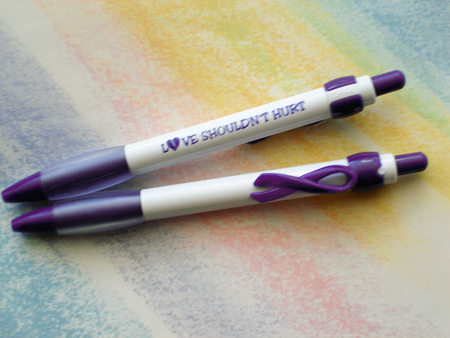 White barrel pen with purple ribbon & the imprint "THERE'S NO EXCUSE TEEN DATING ABUSE" $0.89 each. See info page for quantity discounts.